-The fifth grade band, which played four songs: Bugler's Dream, Across the Serengeti, Dragon Fire and Mountain Hoedown. -The seventh and eighth grade band, which played Song and Dance, As the Robin to the Meadow, and Star Wars: The Last Jedi. A huge thank you to band director Jonathan Roth, chorus director Jayne Seedy and pianist Sal Hughes. 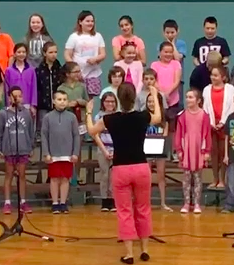 In addition, thank go to Shapleigh principal Anne Ellis, assistant principal Katelyn Beach, superintendent Eric Waddell, the Shapleigh custodial staff and the Kittery Music Boosters. Click here to watch the dress rehearsal of the 6-8th grade performances. Click here to watch the dress rehearsal of the 4-5th grade performances.